20011 Garbage Truck was a 2009 Creator set. It was a BrickMaster exclusive, though available online a the UK LEGO Shop, as it was the LEGO Club Exclusive for Issue 2 of 2009. 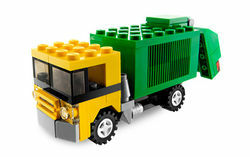 Facts about "20011 Garbage Truck"
This page was last edited on 16 September 2014, at 21:52.